Q&A includes: Will we lose our uniqueness when we evolve into hybrid races? I am finding a lot of pain involved in letting go of old concepts. How do I get to the bottom of how the struggle is benefiting me? How can I enhance my career and/or my mission on this planet? When I shift through parallel realities, does it have another streaming individuated consciousness in it? Is there a message from the Council of Nine for me? What is the reason behind my recurring ankle injuries? Could you explain more about the contraction crystal spiral? Why am I not excited about my new career? Will I miss something if I chose the wrong thing in following my excitement? Will I miss something if I chose the wrong thing in following my excitement? Could you tell us more about the concept of vectors and the symbology of 90 degree angles? Am I doing the right thing raising my three year old boy? 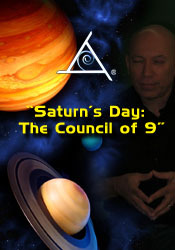 Can the Council of Nine lower their vibration to a quasi physical state?